1. Who is Pop Icon Mr. Cold Call™? 2. What is a Tele-Seminar? It's a seminar that is delivered over the telephone. On the day (and time) of the tele-seminar, all you need to do is use the 1-800 number you were emailed along with your special password to join the conference. You will be able to listen to the seminar, but your telephone call is muted to prevent any unwanted background noise. The seminar is live and is moderated by Pop Icon Mr. Cold Call™. 3. Why is this seminar conducted over the telephone and not in person? Because of the simplicity of teleseminars and their cost-effective structure you can now hear Pop Icon Mr. Cold Call™ at a fraction of the cost versus an in person seminar. Furthermore, tele-seminars are more convenient than seminars that are conducted at a hotel or convention hall. There is no travel time and you can listen to this tele-seminar from the comfort of your office or home telephone. 4. Who should attend this tele-seminar? This tele-seminar is designed specifically for salespeople who use the telephone to set up B2B sales appointments with prospects. If this describes your position and your're looking to increase the number of quality sales appointments that you set with prospects then this tele-seminar is PERFECT for YOU! 5. Someone told me that Pop Icon Mr. 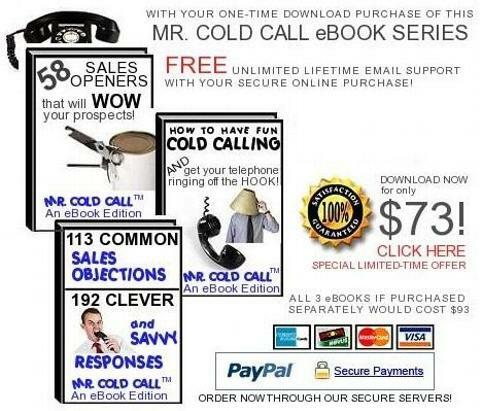 Cold Call™ rarely gives in person seminars and prefers giving seminars over the telephone. Besides the fact that tele-seminars are much more cost-effective for both you and I, what is the real reason for this preference? Pop Icon Mr. 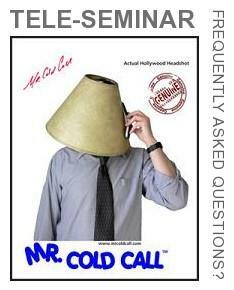 Cold Call™ prefers delivering seminars over the telephone because cold calling is primarily done over the telephone. Pop Icon believes that if you're using the telephone to reach prospects and speak with your customer base then it's only a natural fit to conduct seminars over telepone. So for him, this method of delivery makes the most sense. 6. Can I ask any questions during the tele-seminar? What do I do if I want to ask a question? All live tele-seminars are muted to avoid any background noise. You can submit your question via email directly to Pop Icon Mr. Cold Call™. A special email address will be provided to you after you submit your secure online payment. 7. What happens after I submit my secure online payment and how do I get the tele-seminar number to call in and password? Afer you submit your secure online payment you will then be asked to click on a "RETURN TO MR. COLD CALL INC" button. This button will bring you to an internal page where you're given directions that detail how you retrieve your 1-800 number and password. If you ever have any questions about this tele-seminar at anytime then feel free to email us at support@mrcoldcall.com and we will get back with you within 24 hours. 8. Is the number that you give me to dial into the tele-seminar FREE? For callers within the United States (and Canada) the telephone call to dial into the tele-seminar is absolutely FREE! You will be given a 1-800 number to dial into the tele-seminar. Those who are calling into this tele-seminar from outside the United States are given a seperate phone number to call and unfortunately, international calling charges will apply. 9. On the day and time of the tele-seminar what happens after I dial the 1-800 number? How long is the tele-seminar? After you dial the telephone number the conference system will ask for your password. Use your telephone keypad to enter your password and then press the "#" symbol. The system will approve you and then ask for your first name and then you will be placed into the conference call and the call will begin shortly. The tele-seminar is 55 minutes. 10. I can't make the Live Tele-Seminar, can I buy the download? Sure, you download this Tele-Seminar for only $39! Click here to order now! 11. What exactly does this tele-seminar cover? Discover seven innovative ways to find business leads both online and offline for FREE! 12. When I submit my online payment through your website is my online payment secure? Yes it is! We use Paypal for our secure online transactions. Paypal uses SSL technology to guarantee a safe and secure online shopping environment. Paypal (owned by Ebay) is a global leader in online payment solutions with more than 164 million accounts worldwide. Their online payment solutions are available in 190 markets and 17 currencies around the world. To learn more about Paypal CLICK HERE! 13. Can I share my password with another co-worker or friend? Each caller on this tele-seminar is assigned their own personal password. Your personal password can only be used one-time from your telephone. So basically, your personal password is valid for one telephone line and if you share the password only one person will be able listen. 14. Can I listen to the tele-seminar from my speakerphone so that others can listen? Yes you can, but remember, your password is only good from one telephone line. So while you can use your password from your telephone it cannot be reused from another telephone of a co-worker or friend. 15. I can't make your live tele-seminar can I purchase a recording of it? 16. Do you have an audio samples of Pop Icon Mr. Cold Call™ so I can hear how he sounds?